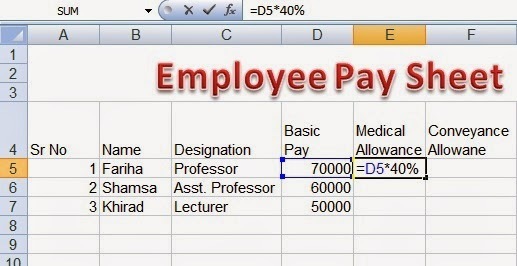 Create a new workbook in MS Excel and save as with the name Employee Pay sheet Formulas. Enter sample data for at least three employees. Enter formula for Medical Allowance = D5 * 40% in cell with cell reference E5. Enter formula for Conveyance Allowance = D5 * 30% in cell with cell reference F5. Enter formula for House Rent = D5 * 50% in cell with cell reference G5. Enter formula for Income Tax = D5 * 5% in cell with cell reference H5. Enter formula for Net Pay = D5 + E5 + F5 + G5 - H5 in cell with cell reference I5. So, the worksheet with Employee Pay sheet Formulas has been prepared successfully. 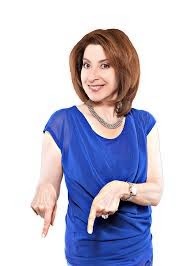 Employee Pay sheet is normally required and maintained in every small business organization. There are very simple formulas are used to calculate monthly pay of the employees working in a small business. There is no need to develop a software for this purpose in a small book shop. 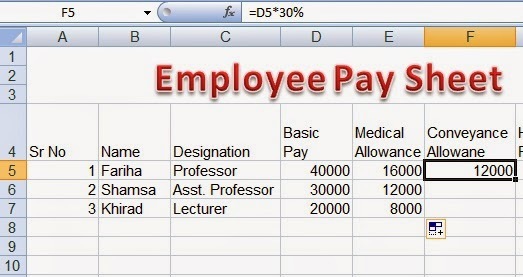 Because, Microsoft Excel can be very useful to prepare such employee pay sheet with formulas. 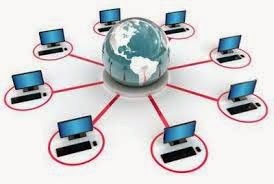 Copyrights 2011-2020, Free Blog and Website Promotion. Powered by Blogger.